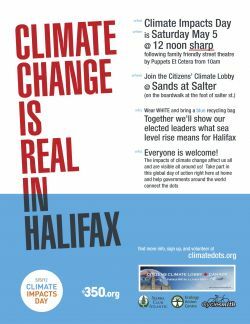 Dear Media, Skaters, Students, Families, Cyclists, Bladers, Walkers, Sustainability Majors, Politicians, Market Goers, Occupiers, Church Congregations, Media, Professors and everyone who would like to be part of a global "Climate Impacts Day" event. Come down to the harbourfront at Slater Street and help us create a visual statement for the 350.org's Climate Impacts Day "Connect the Dots"
Dress up in your funniest or most tragic (whatever your mood) white clothes and bring a blue bag (both not absolutely necessary) and we'll create a "human rising sea level graph" and photograph us for the world wide website at 350.org "Connect the Dots" taking place all over the world on May 5th. Submitted by Joannelight on Mon, 04/30/2012 - 13:21.